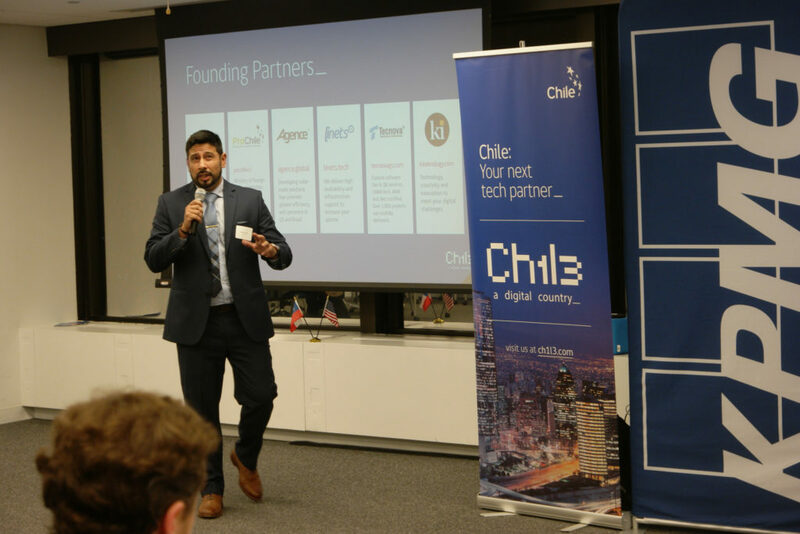 On Monday, October 23rd the Chilean & American Chamber of Commerce of Greater Philadelphia hosted a group of Chilean IT innovators for the unveiling of Chile’s newest technology brand, Ch1l3: A Digital Country. The new sector brand is the creation of multiple Chilean IT companies, in partnership with ProChile, and is represented by four different founding partners: Agence, Linets, Tecnova Global Solutions, and Ki Technology, as well as Chiletec, the chamber of tech companies in Chile. 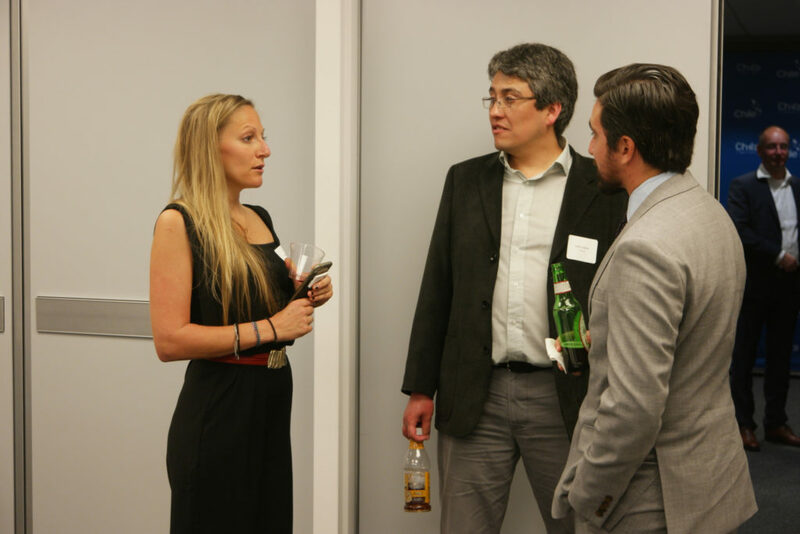 The reception was one stop of a three part tour of the US made by the innovators during an international campaign to promote their new services platform. 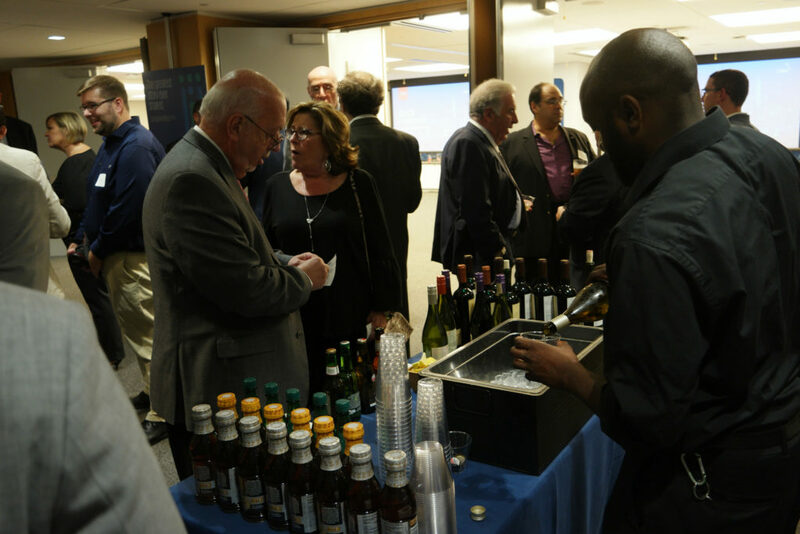 Attendees gathered to witness the official unveiling of Ch1l3 and network while enjoying hors d’oeuvres as well as a variety of different Chilean wines and pisco. 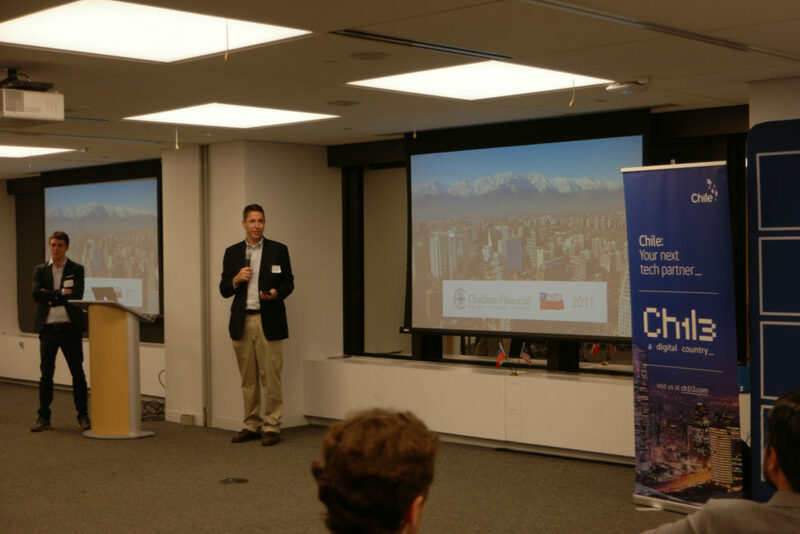 Honorary Consul of Chile for Philadelphia, Benjamin Leavenworth, began the evening by stressing the important relationship between Chile and the Greater Philadelphia region. Leavenworth noted that Chile is a strong, innovative country that has produced a number of mature tech brands including those in attendance. Following Leavenworth’s introduction, Philadelphia Managing Partner of KPMG LLC, Frank Mattei took center stage. 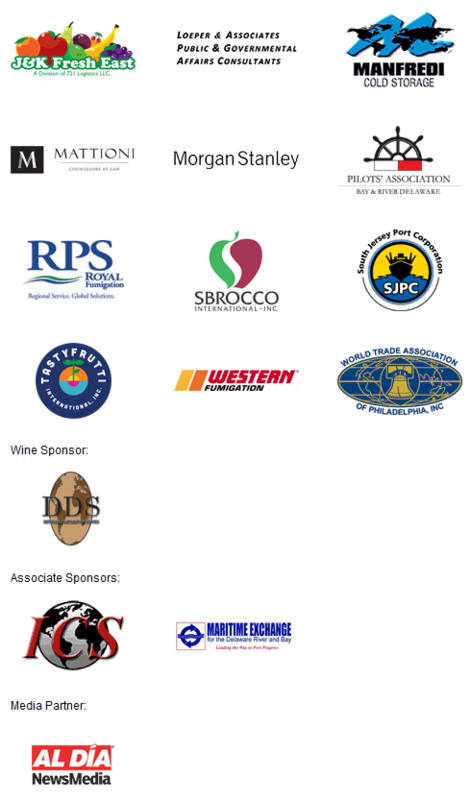 Mattei elaborated on the importance of global networking and wished all in attendance a successful evening. Rodrigo Contreras, Head Economic Department & Trade Commissioner of ProChile D.C., was the night’s third speaker. Before introducing the brand’s founding partners, Contreras expressed his satisfaction with Chile’s ability to export more than just raw materials as part of the fourth industrial revolution. As Martin Lewit of Nisum Latin America made his way toward the microphone, it was time for the official unveiling of Ch1l3: A Digital Country. A short video was shown which described the brand’s function and expressed its importance and relevance to companies in the U.S., explaining that the two countries shared very similar technological cultures. 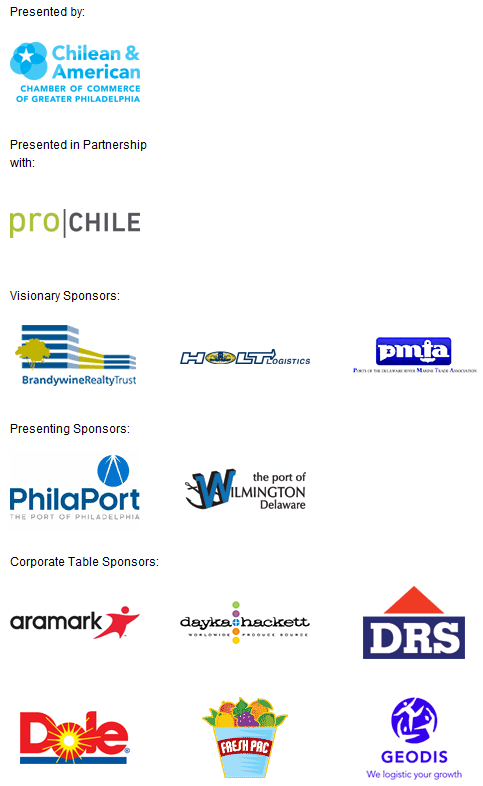 Following the unveiling, additional members from the brand’s founding partners, including Agence, Linets, Tecnova, and Chiletec introduced themselves and the organizations they represent. Shortly after, guest speaker Patrick Millar of Love Park Robotics LLC was introduced. Millar expressed his fondness for Chile both as a tourist destination and as a source of qualified and experienced tech innovators. He then began speaking to the growing success of E-commerce and Robotics in the Philadelphia area, also citing the influence of the fourth industrial revolution. Before Benjamin Leavenworth retook the stage to close the evening, Sylvie Gallier-Howard welcomed the delegation on behalf of the City of Philadelphia. Gallier-Howard thanked those in attendance and spoke about the growing tech scene in Philadelphia, noting that the new tech brand would prove to be a valuable partner to our city. Benjamin Leavenworth then announced the winners of the night’s wine and pisco raffle. Leavenworth proceeded to thank those in attendance and encourage anyone to reach out with any inquiries before closing the evening’s presentations. 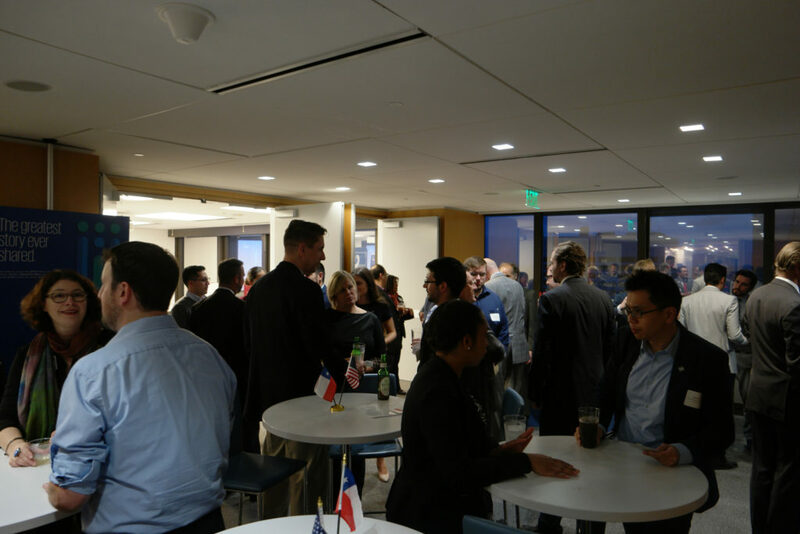 Thank you to KPMG for graciously hosting us in their space and to Select Greater Philadelphia for partnering with us on this event. Also, gracias to ProChile for kindly providing the Chilean Pisco. 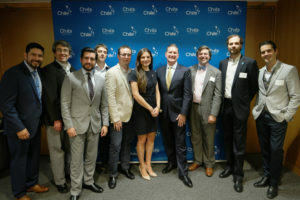 For more photos of the unveiling of Chile: A Digital Country, please visit our Flickr page. To read more from AL DÍA News, click here. Did you know Chile has the most internet users* in all of Latin America? Named the “most innovative country for early-stage entrepreneurs,” Chile also takes the top spot in all of Latin America for best business environment, overall competitiveness, and most economic freedom.